How the CaterShark Online Ordering System Works! The restaurant ordering system can be completely setup and configured within a couple hours of your time. Here's how it works and what you'll need to do to get started. Navigate to our Pricing page and select your plan. Simply monthly fee and no hidden costs! Complete the one-page signup process by entering your business or restaurant name as well as some other information about yourself, then submit the form! 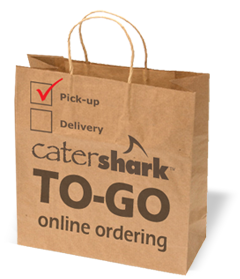 Your CaterShark online ordering site will be automatically created within about 30 seconds! If you entered "PizzaDen" as your restaurant name, then your site would be created as www.AdvancedChef.com/PizzaDen. This would then become the web address that your customers would need to access to place an order with you. Then, simply add a link to this web address to your existing web site or even a FaceBook page. Even send it out in an email to your customer! Now that your CaterShark web site has been created, you will be automatically taken to your administrative login page. Just enter the username/password that you created on the Signup page and Login. Now, you will need to setup your Online Ordering preferences by navigating to Site Setup -> Online Ordering Setup. How do I receive food order alerts and ensure orders are not overlooked? You receive automated voice phone messages, SMS Text notifications, and/or email notifications as the orders come in so that you can have the food prepared on time. Most of our customers simply add an extra cell phone line to their existing wireless plan or even to their personal plan for roughly $10 extra a month and place this by their register or POS system. This line is then dedicated to receiving one of the various food order alerts as they come in. Pay As You Go TracPhone's and inexpensive flip phones are also popular and this helps ensure your orders are never overlooked when they arrive. After your online ordering preferences have been setup, the last setup step is simply to add your Food Menu into the system along with your prices. Our easy to use menu manager will allow you to add your food into the system along with images and descriptions. Customer sees your menu and can begin adding food items to their shopping cart. Lastly, the customer can pay with either Credit Card or PayPal. You also have the option of allowing the customer to pay at the time of pickup or delivery (this is a configurable option under Online Ordering Setup). You will then be notified with whatever mechanisms you setup under Online Ordering Setup: Automated Voice Notifications, SMS Text notifications to one or more dedicated mobile phones, Email Message sent to one or more email addresses along with the food order attached in a PDF file, even Calendar Items can be configured so they pop into your calendar on your smartphone or google calendar! Our newest notification option now also actually calls your restaurant and an automated recording reads the entire food order details to you so that it can either be written down or entered into your POS terminal! Never miss an order! The customer will also receive a confirmation email with the details of their order. That's it! Your money will sit in your PayPal account until you are ready to withdraw it by direct deposit to a checking account or by other mechanisms that PayPal has in place. AdvancedChef takes a small transaction fee of .20 cents per order as well as standard credit card rates apply and are established by PayPal. For more information on PayPal, please check out our Paypal Payments Page. View the Pricing Page for the Restaurant Ordering System!